In this guide, we will introduce you two solutions to track someone's location without them knowing. Tracking a person's location is a common need nowadays because of many reasons such as one of your close people is living away from you and you can’t reach her in either through phone or through social media. Knowing where is someone is probably the most comforting and a very valuable technology to have. You couldn’t be more confident knowing your children are safe wherever they are. As a parent, there are few things more terrifying than not knowing how your child is using their phone. We get lot of questions like "How can I track my son's phone without his knowing?" or "How can I track my daughter's iPhone without her permission?" With a cell phone spy app, you can easily know about everyone they talk to, who they chat with, what sort of pictures they're taking, and more. No one wants to be suspicious of their loved partner, but sometimes people cheat. In this situation, you have to make sure there's no funny business going on behind your back in order to protect yourself and your family. A cell phone tracking app does exactly that and more. They allow you to monitor the movement of the phone using it's built-in GPS. Every few minutes you'll be able to see an updated location of their phone. You can even setup geo-fencing zones so that you get notified when he or she goes to a specific location. Within minutes of their arrival you'll receive a notification on your phone. PanSpy is a professional monitoring solution provider specializing in tracking and monitoring tools for smartphone users. It allows parents monitor text messages, calls, current GPS location, SnapChat, WhatsApp and many more. Equipped with numerous useful features, including GPS tracking, text and call logs, website blocking, and keyword alerts, the PanSpy cell phone tracking software is intended to protect both, minor children from online dangers and business owners from corporate information and assets leakage. Step 1 . Create An Account. Go to the PanSpy website, click Sign UP button. Use an authentic email address to sign up PanSpy. After successfully create a PanSpy account, it will send a confirmation link to your Email to activate your account, simply navigate to your Email address, tap the link to activate your account, then follow the Setup Wizard to finish the following setup process. Note: PanSpy now offers time-limited free registration, allowing users to experience mobile monitoring service. Don't miss it! Step 2 . Install Software. After successfully subscribe the service, you will get a download link to download and setup the PanSpy app. So simply download and install the app on your child's mobile device, login your PanSpy account, and follow the instructions given to set and give the app permission to access data on the target device. Step 3 . Start Monitoring. After finished the setup process on target device, turn back to the control panel on your computer. All supported features are listed on the panel so that you can click each category to view the data. To track someone's location, simply click on Location tab on the left side of the dashboard. mSpy is a great monitoring application well-designed for spying on iPhone or Android devices. It allows you track a cell phone’s location remotely, and offers you with great insight into several aspects of the device. With three different plans to choose from, mSpy is easy to install and when done successful unlocks some great features including the ability to track calls and messages and even access installed apps on the target device. Using mSpy you cam protect your kids when you are not around and ensure they are not involved in anything dangerous. Note: to use GPS locator your target device should be rooted/jailbroken. Set safe and dangerous barriers with a geofencing feature. 1.Purchase mSpy. Select the mSpy subscription package that caters to the needs of your family. Fill in the billing information and submit your order. Once the payment is confirmed, you will receive a welcome email that will take you to the mSpy Control Panel. 2.Install Software. Log in to your Control Panel and follow the instructions. 3.Start Monitoring. Log in to mSpy Control Panel to start tracking GPS, instant messages, browsing history and any other activities taking place on the monitored device. This is an all-inclusive location tracking app available for both Android and iOS devices. It is very easy to use when it comes to knowing the whereabouts of your near and dear ones. It comes with a wide range of advanced features apart from simply tracking your cell phone’s GPS location including viewing call history and monitor call logs, track text messages, monitor WhatsApp, previewing videos, spying installed apps and photos, etc. Spyzie comes to you in a choice of two monthly subscription plans—Premium Edition and Ultimate Edition, each with their own rich set of features. You can simply open the app and keep tracking your required person’s location directly from your device. Now, we’ll show you some basic steps to use the app to track your required person’s location. 1. Firstly, create an account on Spyzie to get started. Note that the registration for an account can be complished on both the site and the app. 2. In the setup wizard form, leave all the required information of your target device that you wanna track. Note: you can only track Android devices right now. Tracking feature for other types of devices will be in further updates. 3. After completing the setup form, click the “Next” button under the page and then install the app on your target device so that you can track that remotely. Now, you still need to download and install the monitoring app on your device through which you can easily check the updated records of your required locations. 4. 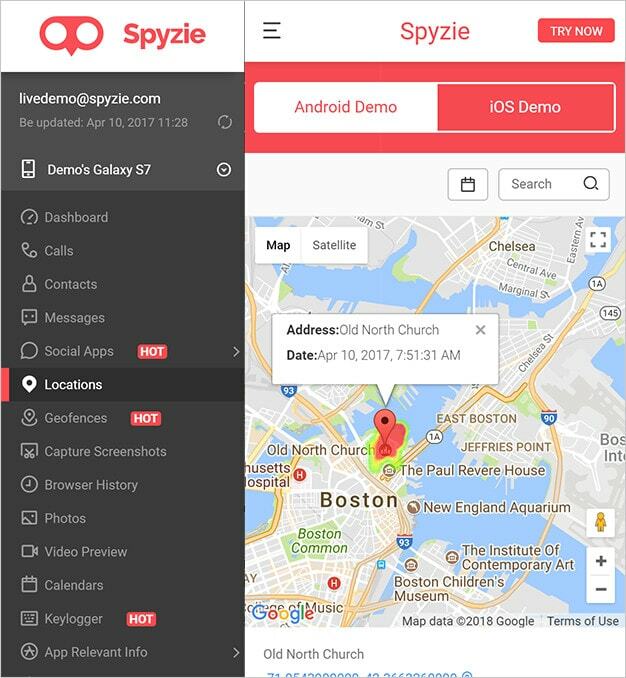 Navigate to your Spyzie dashboard to monitor everything in the convenient way. You will find that the dashboard is seen where different target people have been added so that their locations along with many other information can be traced in real-time. 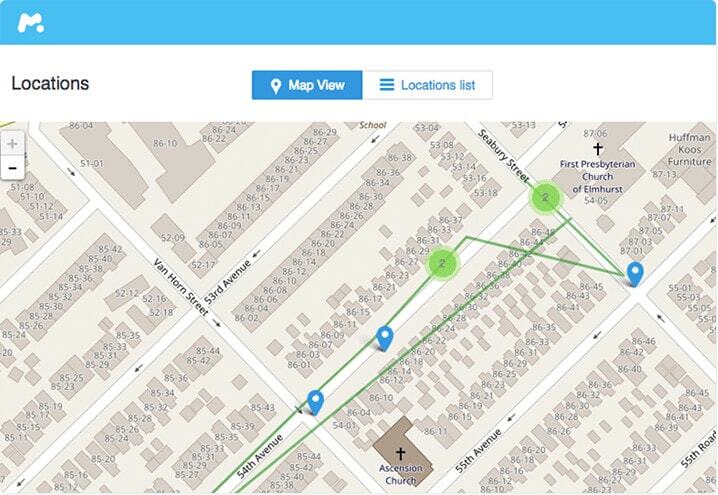 These three tracking programs will give you the phone’s location any time you may need it. Cost-efficitive, versatile and easy to use, we think they are nice and effective methods that you can use to track someone's location by their cell phone. You can create an account for PanSpy to get one month free trial now!